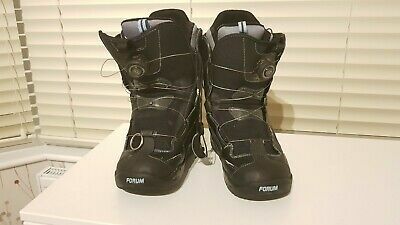 Please find here my Son s snowboard boots. Yes he wore these and loved them !Just outgrew them. These boots have the greatest lace-up system called BOA - a stainless steel wire and quick release system which is really easy for the wearer to do up themselves. The boot liners are completely removable to aid airing/drying.The sizes shown are those printed in the label. Slight wear on the side of the boots from the bindings and one of the BOA mechanisms needed reattaching, which I have done with epoxy and they seem very secure - see the photos. 100% of this sale price will go towards a very good charity, so grab yourself a bargain and know you are contributing to a great cause too.You can arrange to collect either in Bexley, Kent or Bloomsbury, Central London.You you opt for the courier option it will go by Hermes only - anything else is way more aggravation. UK Mainland only ! Postage will be the cheapest I can get with insurance and a signature. Cash is available on collection - and the charity will automatically get the sale price.